Turns out, this was a pretty apt observation. Though I don’t share Ebert’s disdain for the Slasher movie format, it’s undeniable that “The Tour of the Dead,” as I term it, has become a de rigueur component of the sub-genre. In the so-called Tour of the Dead – universally set during the final act -- the resilient Final Girl flees from a terrifying mad-dog killer (usually masked), but the bloodied and savaged corpses of her friends and associates begin popping up in her path...sometimes quite violently. 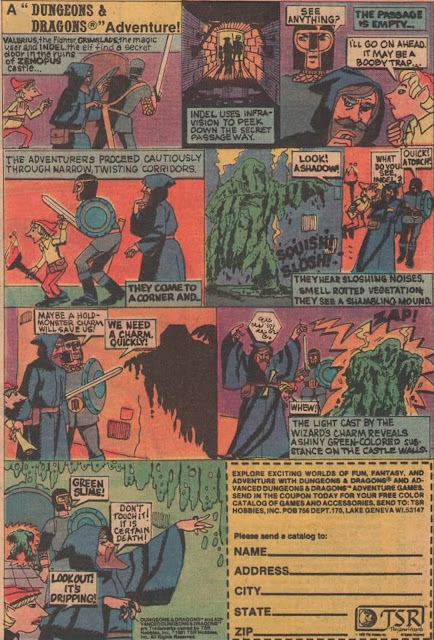 The sudden re-appearance of these murdered characters provides both authentic jolt scares for the audience, as well as horrifying obstacles to the character’s successful escape trajectory. One of the earliest (and still best…) Tours of the Dead appeared in John Carpenter’s Halloween (1978) and thus fits in with that film’s organizing principle: Halloween festivities, including trick-or-treat pranks. Here, poor Laurie Strode (Jamie Lee Curtis) visits the house across the street in suburban Haddonfield, and sees the body of her friend Annie (Nancy Loomis) posed on a bed…underneath a tombstone for Michael's sister, Judith. As Laurie recoils in horror from this macabre sight, other corpses pop out to terrify her, thus providing more than Laurie’s Halloween quotient of “one good scare.” Laurie grows so terrified that she absently seeks retreat (walking backwards, a big horror movie no-no…) at the doorway of a dark room…where the white-masked Shape emerges from impenetrable blackness. I was happy to see in the 2018 Halloween, there is at leas a little tour of the dead in the final act, with Laurie Strode following a blood trail to a closet, and discovering a victim of "The Shape" perched inside. The Friday the 13th movies of the 1980's quickly adopted the “Tour of the Dead” convention, starting in the first film. There Alice (Adrienne King) runs from nutty Mrs. Voorhees (Betsy Palmer), and navigates a veritable battlefield of dead bodies. Steve’s corpse comes down swinging from a Camp Crystal Lake sign, for instance. Another corpse gets tossed through a window at Alice. Yet another ends up hanged on a cabin door. For the sequels, it was a case of rinse-and-repeat as imperiled Final Girls ran similar corpse gauntlets before earning their victories. The Tour of the Dead convention is entertaining in these franchise films, but entirely devoid of the "trick or treat" context of Halloween it doesn't make a whole lot of logical sense. Mrs. Voorhees (and later Jason) not only move from place to place killing camp counselors, but apparently pose the bodies, and calculate -- with precision accuracy -- what path the prey (like Alice) will ultimately take. What makes the conceit interesting (and a little funny...) in the original Friday the 13th is the way that director Sean Cunningham uses signage like "Danger," or "Keep Out" to subtly punctuate the gruesome exhibits on the Tour of the Dead. In some fashion, the Tour of the Dead is is not just a final challenge to navigate and a visual symbol that the Final Girl is really and truly alone and therefore without help, but a bloody reminder (to the character and to the audience) that she was right about sensing danger. Final Girls – at least the good ones – boast insights, values, feelings, and behaviors that their more impulsive friends lack. And by undergoing the Tour of the Dead, the Final Girl gets confirmation of her greatest character traits. She was right..and is still alive. Her friends were wrong and are now...ornaments. In some Slasher movies, the Tour of the Dead is more ritualized than in others. 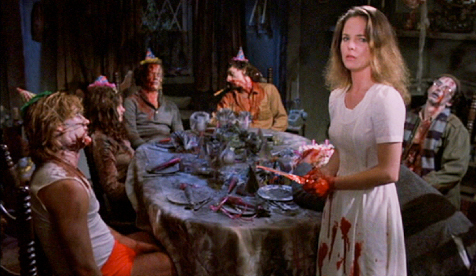 In films such as Happy Birthday to Me (1981) for instance, victims' bodies are propped up at a table (with a birthday cake…) and posed as if at an actual birthday party. In Tobe Hooper's brilliant The Funhouse (1981), the bloody corpses become part of the amusement park environs, therefore blending entertaining, funhouse-style horror with the real thing. As is the case with other elements of the horror lexicon, "The Tour of the Dead" reveals how the best horror directors deploy familiar conventions to good and inventive effect, while others just ape and imitate for the heck of it, for the sake of doing something that's expected, rather than what best tells the story.